Far Beyond Mailroom While tracking and organizing incoming and outgoing mail is a challenge, mailroom automation software helps simplify and automate delivery processes. Here are three ways that youâ&#x20AC;&#x2122;ll miss by not investing in mailroom automation software. Decreased Operational Costs ➢ Automating many of the tasks associated with mail management ➢ Enables organizations to streamline their delivery staff and resources ➢ Helping to save personnel costs ➢ Automation decreases the potential for human error, which means increased accuracy. And with higher accuracy comes greater efficiency and productivity. Supporting Mobile Workforce â&#x17E;˘ Some employees are not even in the office at all but are mobile. 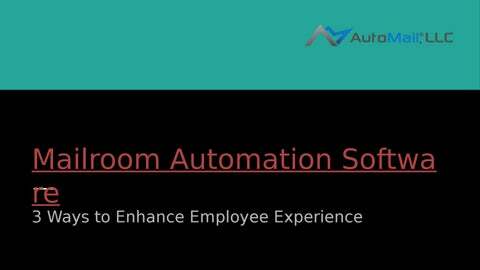 Mailroom automation helps automatically import employee data and is better designed to support the mobile workforce. â&#x17E;˘ Notifications can be sent from these systems via email or Slack notifying an employee that a package has been received and is ready for pick up. â&#x17E;˘ Employees receive packages and critical documents in a timely manner and are efficiently notified of delivery status. breakdowns The software also tracks the whereabouts of each piece of mail at all times Provides every person involved in the transaction with access to the mail’s progress. Both your clients and your prospective clients receive the mail they need. For the foreseeable future, postal mail isn’t going anywhere. Contact Us Eliminate the headaches of the mail delivery process â&#x20AC;&#x201D;invest in mailroom automation software today.